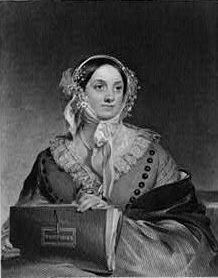 Eliza Leslie lived from 16 November 1787 – 2 January 1858. Her 1827 book “New Receipts for Cooking” was not an entirely well organized book. It starts off with a chapter on organization but she slips in tips for cleaning and other recipes all over the place as she goes along. Her 1837 book, “Directions for Cookery: Being a System of the Art, in Its Various Branches” was the most popular American cookbook in the 1800s, and was reprinted over 60 times between 1837 and 1870. The measurements she gives in all her books are imprecise. Eliza was born in Philadelphia. She was the first of five children born to Robert Leslie, a watchmaker, and Lydia Baker. In 1793, when she was five, her family moved to England for her father’s watchmaking business. They returned to live in Philadelphia in 1800. In 1803, when she was 16, her father died. The family had to take in boarders; she, being the eldest child, helped her mother prepare the meals. In the early 1820s, Eliza graduated from “Mrs. Elizabeth Goodfellow’s Cooking School” in Philadelphia. Her first book, the 1827 one, was a collection of the recipes that she’d picked up at school. She died in Gloucester, New Jersey. One of her brothers, Charles Robert Leslie, became a painter and a writer in England. He died a year after Eliza, in May 1859. Another of her brothers, Thomas Jefferson Leslie, became a paymaster in the American army. “Pigs’ Feet, Fried: Pigs’ feet are frequently used for jelly, instead of calves’ feet. They are very good for this purpose, but a larger number is required (from eight to ten or twelve) to make the jelly sufficiently firm. After they have been boiled for jelly, extract the bones, and put the meat into a deep dish; cover it with some good cider-vinegar, seasoned with sugar and a little salt and cayenne. Then cover the dish, and set it away for the night. Next morning, take out the meat, and having drained it well from the vinegar, put it into a frying-pan in which some lard has just come to a boil and fry it for a breakfast dish.” — Eliza Leslie. New Receipts for Cooking by Miss Leslie. 1854. “The best curry powder imported from India is of a dark green color, and not yellow or red. It has among its ingredients, tamarinds, not preserved, as we always get them — but raw in the shell. These tamarinds impart a pleasant acid to the mixture. For want of them, use lemon.” — Eliza Leslie. New Receipts for Cooking. 1854.